Home SPONSORED POST TRAVELOGUE Travellers, it's time for Traveloka SALE-ABRATION! Travellers, it's time for Traveloka SALE-ABRATION! I love to travel. I mean, who wouldn't want to be on that airplane and travel to other countries or even just to visit local attractions. I'm sure 9 out of 10 people would say that they love travelling. But of course, for some, the high expenses needed to spend on flight tickets and hotel bookings made they hold back their dream of travelling. It is now the time to realize that dream of yours as Traveloka currently offering you the best of the best flight and hotel booking deals you can get. So travellers, let out your excitement because it's the time for SALE-ABRATIONNN! *clap clap. But first thing first, What is Traveloka? Almost everything is available at the tips of the fingers nowadays as there are tonnes of website for us to purchase something we want such as apparels, gadgets and of course, travelling deals. It's just that online shopping is far more convenience for us. So Traveloka is a one-stop flight and hotel booking platform for both domestic and international destinations. The booking process with Traveloka would be the best choice as their website has a minimalist design and free from unrelated advertisements which would make searching, booking and managing your next trip hassle-free! You can also book your next flight or hotel using Traveloka's free app from your expensive smartphones immediately. Just search 'Traveloka' in the App Store and the app would be the first suggestion or just simply enter your number or email address at the footer section of Traveloka's website and they will send you the download link for the app. You will never miss out any promotion again if you download the app. 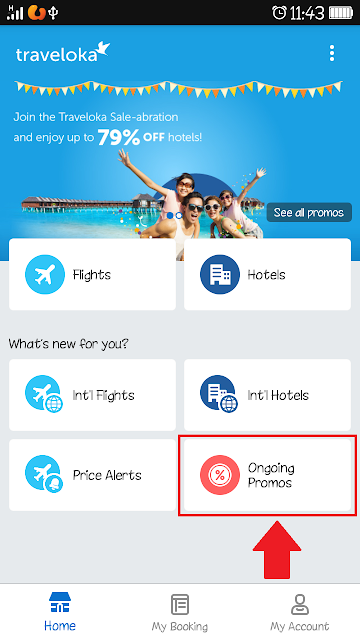 Just click the 'Ongoing Promos' button on its homepage and you'll be directed to the current promotions Traveloka is offering. I must tell you that the promotions are very enticing and you wouldn't want to miss that! You will never have to use multiple tabs for different airlines websites again as Traveloka would help to compare flight deals across those multiple airlines instead for you. They will also book only the best deal value for your money to your dream domestic or international destinations. The flight deals come for every kind of budget which are as low as RM40 to domestic destinations and below RM100 to international destinations. They are so affordable that you don't need to empty out your pockets again! Partner hotels have been carefully selected to cater to various types of travel purposes, whether for shopping, visiting cities rich with culture and heritage, relaxing by the beach and many more to ensure you have a great stay for your next trip. With easy booking access through Traveloka's website or their free app, over 100 exclusive Traveloka-only hotel deals for destinations around Southeast Asia to cater for different types of travel purposes for you. You don't have to trouble yourself comparing hotel deals from their respective websites or making reservation calls anymore. The things that we would be concerned regarding making an online booking is the privacy of our personal information and banking details. Just know that all information in Traveloka are fully encrypted and protected for data security, so there's nothing you need to worry! Traveloka only offers the best and honest price for you to choose. What you see on the booking details is what you need to pay as they don't have any hidden charges so it's easier to plan for your expenses. The faster way to make your bookings by adding your card details only once for all future transactions. Less effort and time consuming for the process, you know you love that! Traveloka also offers a 24/7 customer service so it's very convenience for you, especially if you're a working person. You can contact them for any inquiries even at night! 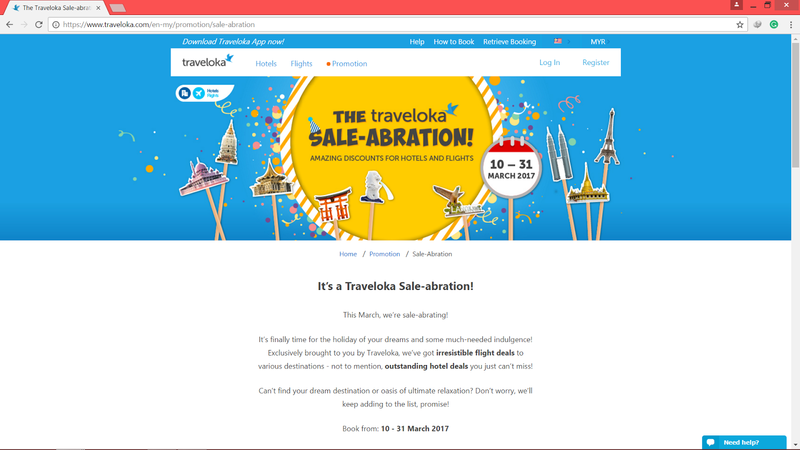 Traveloka always have hotel and flight promos and this time, it's the SALE-ABRATION! You surely don't want to miss that so click the link below to start your booking! I myself had booked with Traveloka a few times for flight and hotel deals and I can ensure you that your spending would be worth the deals offered. Don't wait any longer, click the link and start your booking before the promotion ends! Have you ever book flight or hotel deals with Traveloka before? Tell me your experience! Traveloka ni memang banyak harga flight dan hotel yang murah kan? hehe.